I attended Holiday of Play as media. All opinions are honest and solely my own. It’s beginning to look a lot like…Christmas? I’m not ready to admit that, especially because I haven’t started my shopping yet. I’m one of those people that usually start my shopping in July. What I am ready to admit is that this year there will be lots of really cool stuff for our littles to add to that list. 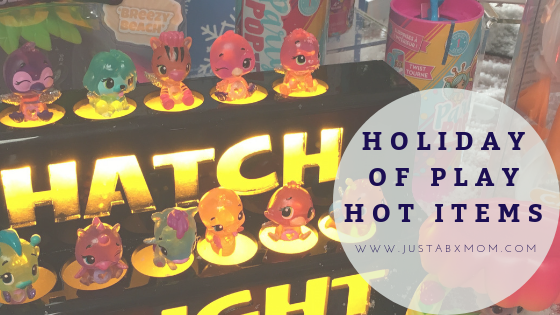 I got to have a sneak peek at some of the hottest to hit the market at The Toy Insider’s Holiday of Play last week and let me tell you they are heroes of play. Here are a few of my favorite items from the event. Let me know which ones you think your littles will be adding to their list. Boxy Girls– These dolls are the perfect gift for little unboxing lovers, which let’s be real, are just about all of our littles. They each come with four shipping boxes that littles can open to reveal fashion surprises, including clothes, bags, makeup, jewelry, and more. Hairdorables– These dolls are the unboxing surprise. Which of the thirty-six will you get? Each Hairdorables has its own personality, style, and talent. I love that there’s three styles of each girl to show you don’t only have to be one thing. Hatchibabies– You already know that we love all things Hatchimal. We cannot wait to see what they are hatching this time with Hatchibabies. Will it be a boy or girl? We all have to wait until October to find out. Flybar Ipogo Junior– JustaBXgirl and one of her cousins have already listed pogo sticks on their lists. This light-up pogo stick has a screen that tracks consecutive jumps. It also counts out loud and encourages kids with motivational phrases. Features comfortable rubber hand grips and non-slip foot pegs. So, yup, this is the one she’s going to flip for! Gnomes At Night– We love games. I love that this game is about working together as opposed to who can win. Can you and your partner get out of the maze and find the treasure? Ooz-o’s– Remember when the word slimeball was a bad thing? Horizon Group USA has changed that. Ooz-o’s are oozing slimy spheres and you can squish them to make the even slimier center ooze out! I also love that there are different ones to collect. My favorites are the unicorn and galaxy ones.